Cottonwood Road can be found at milepost 46 of Arizona US 93. It provides access to Lake Mohave. It is 19 miles of well maintained gravel road from the highway to the water's edge. This is primarily fishing access, but there is no launch ramp for boats. Sometimes the gravel of the road is loose, watch your speed. The mountains stand out beyond the lake. There is a lot of open space to explore. 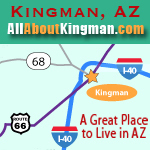 about the cities and towns of Mohave County Arizona.